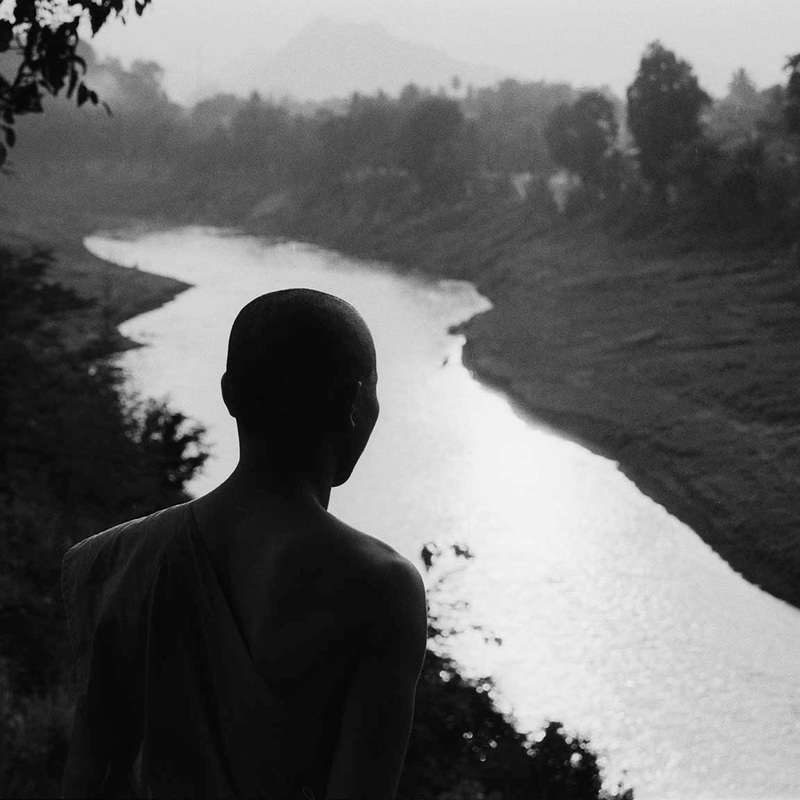 Honoring the Spiritual Life of Theravada Buddhist monks and novices in Luang Prabang, or twenty-four years, German photographer and writer Hans Georg Berger creates images of power and rivers of meaning. 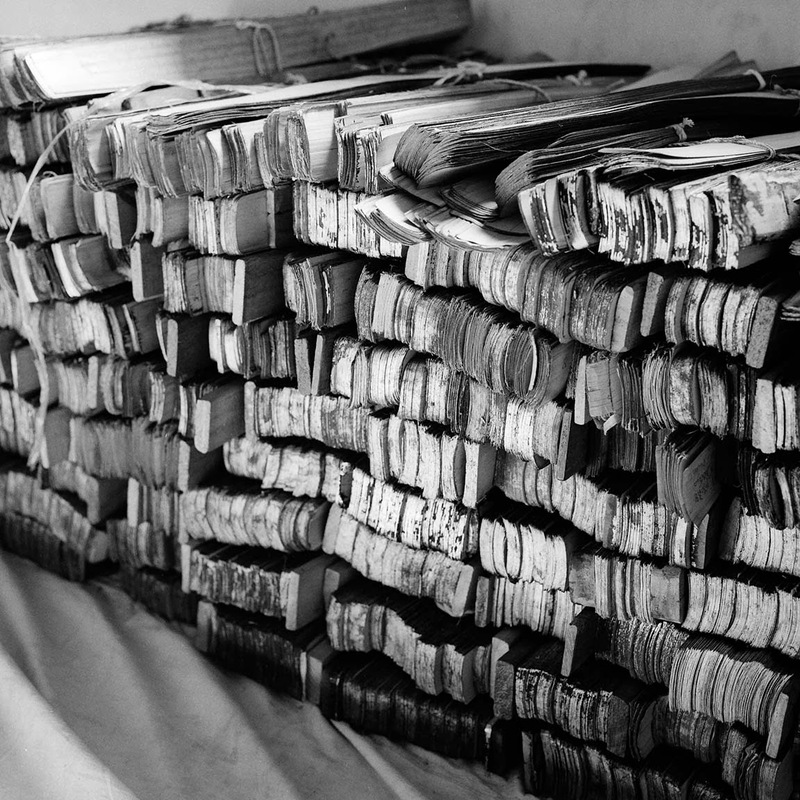 I’ve also put together book lists and where to find these inspiring photographs. It’s time for you to make a lovely pot of tea (or a little glass of vintage Port.) And sit down to contemplate more than fifty images, all presented exclusively here. We are going on a journey. Come with me. 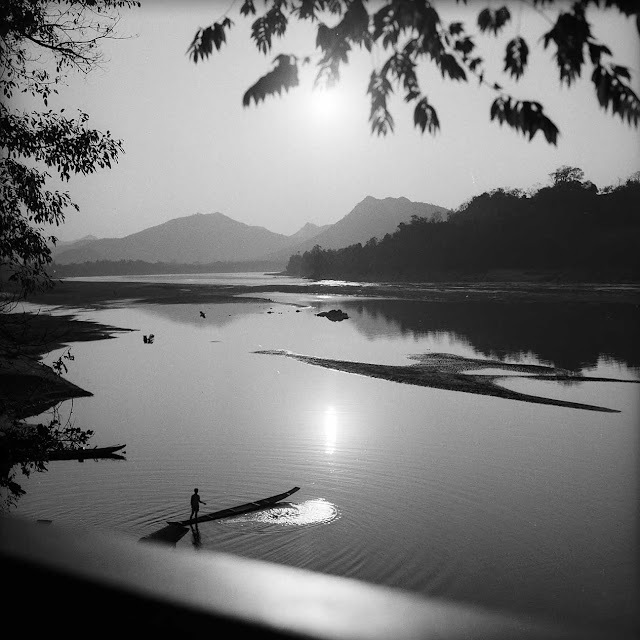 In Luang Prabang recently I was fortunate to enjoy daily viewings of black and white photographs by Hans Georg Berger in the Amantaka Collection at Amantaka resort. As you will see below, Adrian Zecha, the brilliant founder of Aman Resorts discovered Hans George Berger on his first exploratory visit to Luang Prabang over a decade ago. Zecha decided to gather a collection of more than 100 images—and use the hotel as a gallery. Guests or a visitor dropping in for lunch or drinks or dinner can see them in the foyer, library, restaurant, and in all rooms. I’ve collected a rare and inspiring viewing of exquisite and moving black and white photographs. 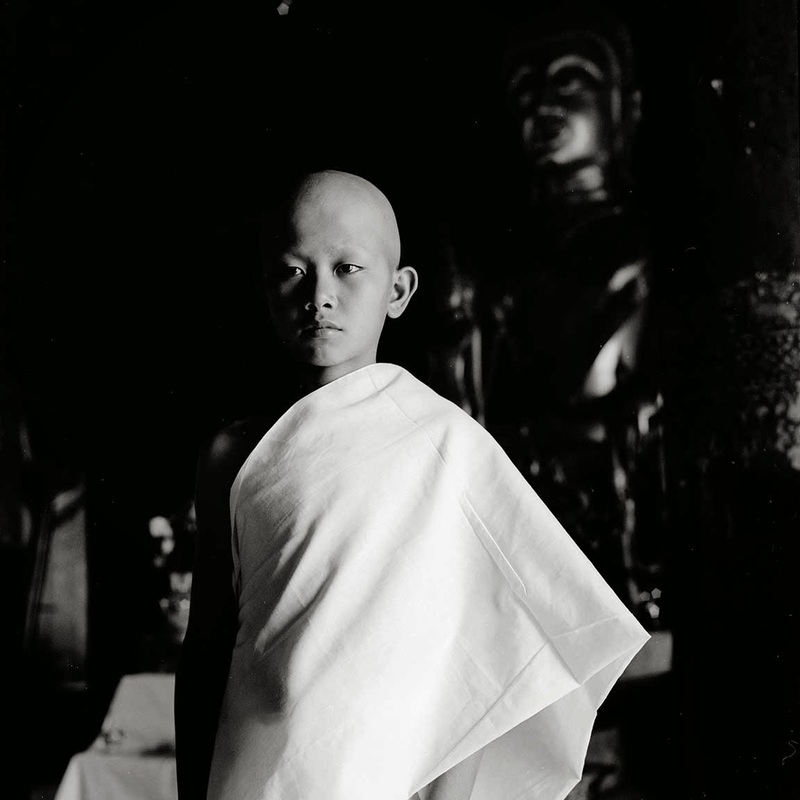 For your enjoyment this week, for the second part of my Luang Prabang, Laos, trip report, I have the exclusive images and story of German photographer Hans Georg Berger’s devotion to recording, revealing, respecting and honoring centuries-old Buddhist traditions in Luang Prabang. Oh, and if you missed Part One of Luang Prabang, with lots of travel information and insider tips…simply scroll down and you’ll find it. I admired the way the photographs took me inside the lives of the monks. 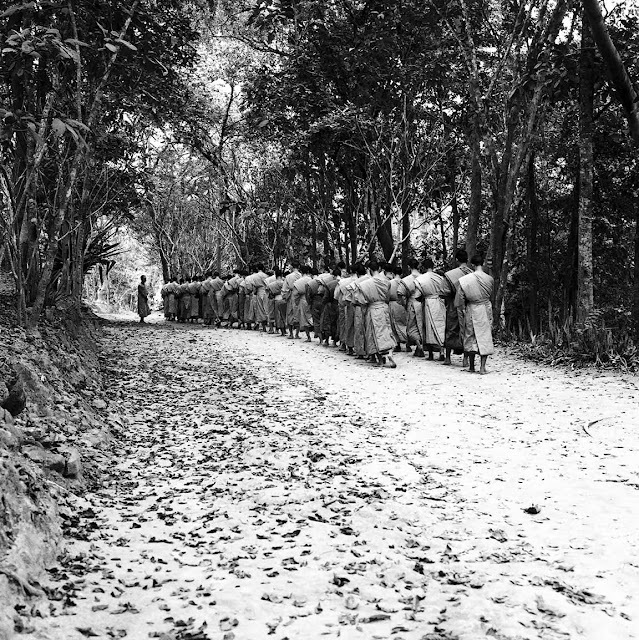 I would see them every day going about their practice, their meditations, or walking from their monastery to the nearby temple. The photos lead the way to understanding their lives. The images gave me an insight into the invisible, and what lies just beyond. My visit to Laos and Luang Prabang was enhanced by these pieces of fine art. 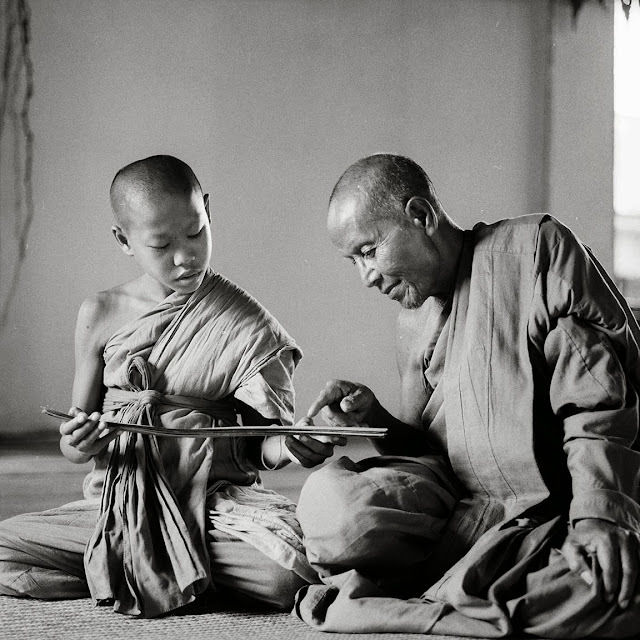 “Do remember: they are NOT MY PERSONAL VISION of Buddhism, monks, their ceremonies, and Luang Prabang. 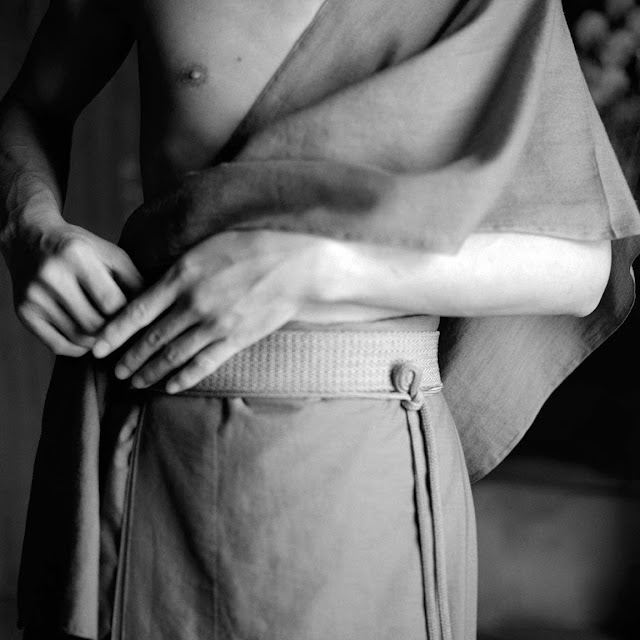 Their strength lies in the fact that they are fruit of a long-term, twenty-four-year communication process with the monks on what is important to them, on what they want to convey to the world. I have been the learning part in this process. The very privileged learning part.” — Hans George Berger, in conversation December 18, 2013. Monks often go to the forest and jungle near Luang Prabang for intense retreats. At that time, the traditions of centuries-old Theravada mediation forms are passed on to novices. The self and time disappear. 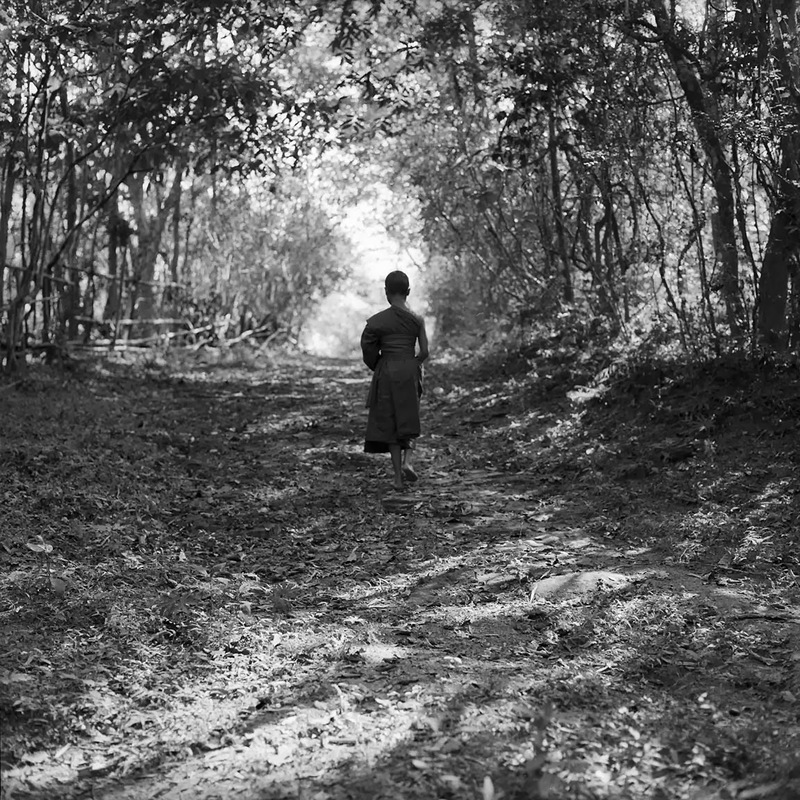 It is the non-self that is seated among the leaves, walking in unison in the forest, or reclining and mediating. 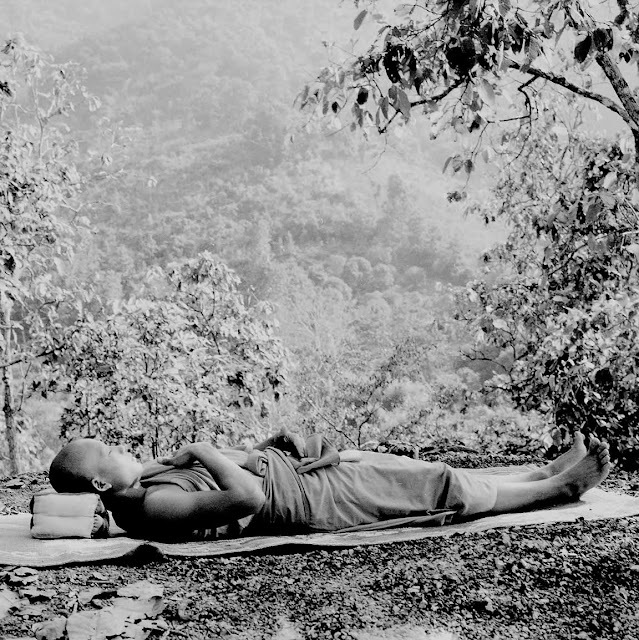 No activity is more important in monastic life than meditation. It is through meditation that a monk achieves serenity, through meditation that he achieves insight-wisdom, and through meditation that he may attain his ultimate goal—enlightenment and nirvana. There is a passage in the Majjhima-nikaya where someone approached the Buddha and asked him whether he could summarize his teaching in one phrase and, if he could, what it would be. 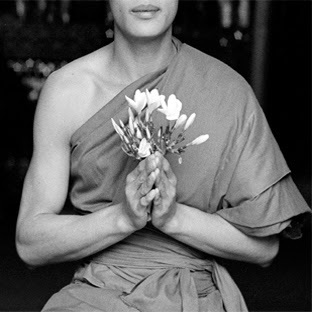 The Buddha replied that he could, and he said “Sabbe dhamma nalam abhinivesaya.” Sabbe dhamma means “all things”; nalam means “should not be”; abhinivesaya means “to be clung to”: nothing whatsoever should be clung to. 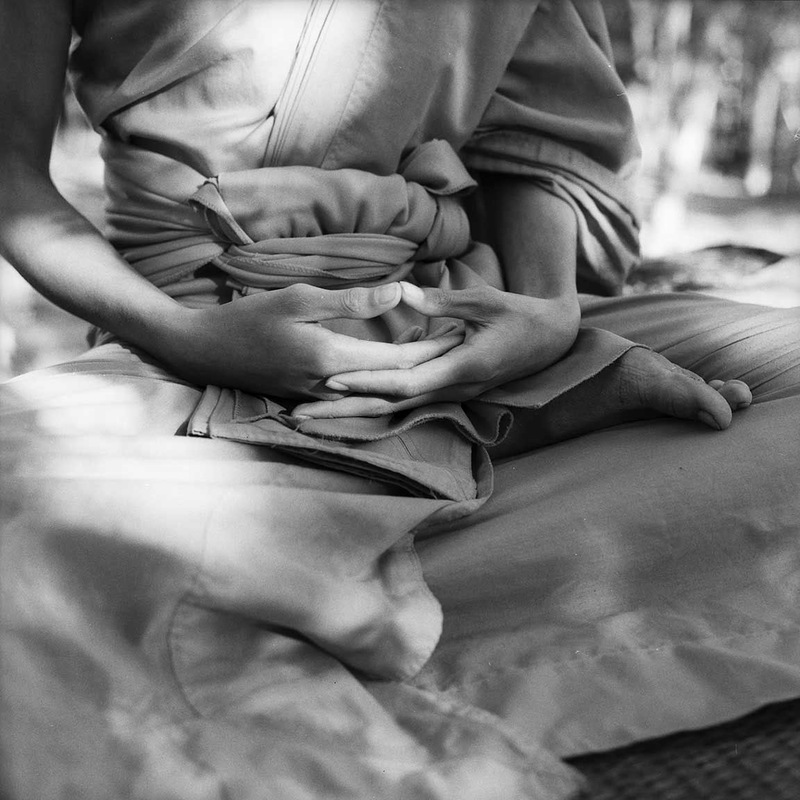 On the way to this understanding, a series of body exercises (practiced in four postures—sitting, walking, standing, or lying still) may lead the way to other intellectual and deeply spiritual exercises. I asked Hans Berger about the silence of the monks I had seen in town. 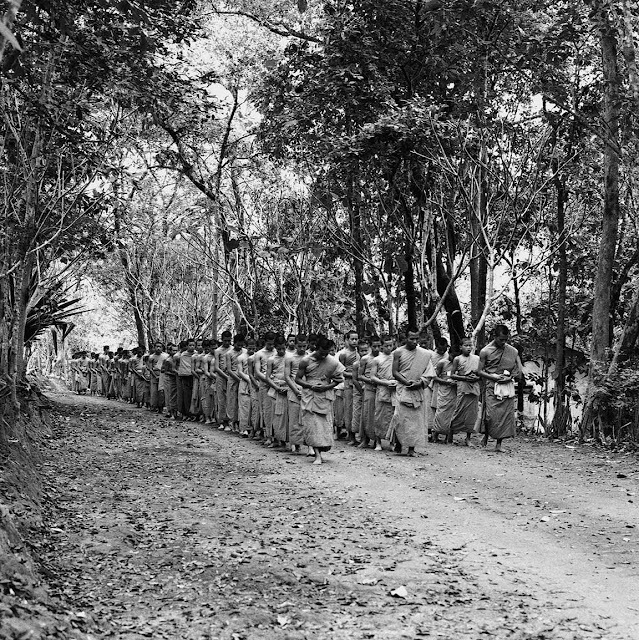 Even walking together along the river or near the temples, young novices are silent. 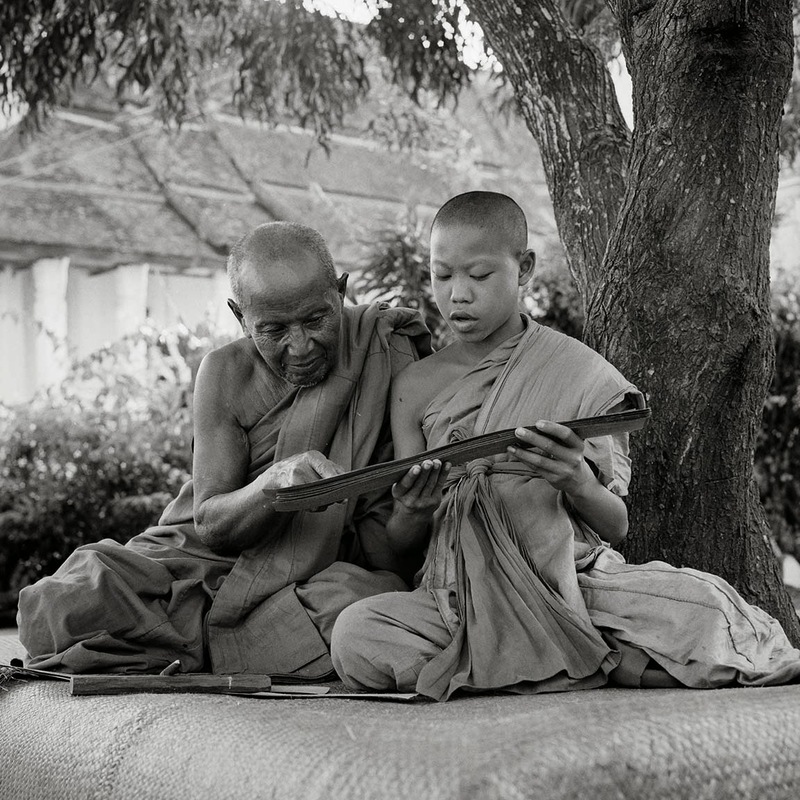 I note that the monks in general keep quiet (the younger ones, anyway). You don't see them loudly talking at the monasteries or walking along.They are quiet, peaceful, tranquil, not loud. I asked Hans if this is a precept. Their composure gives Luang Prabang a peaceful quiet mood. 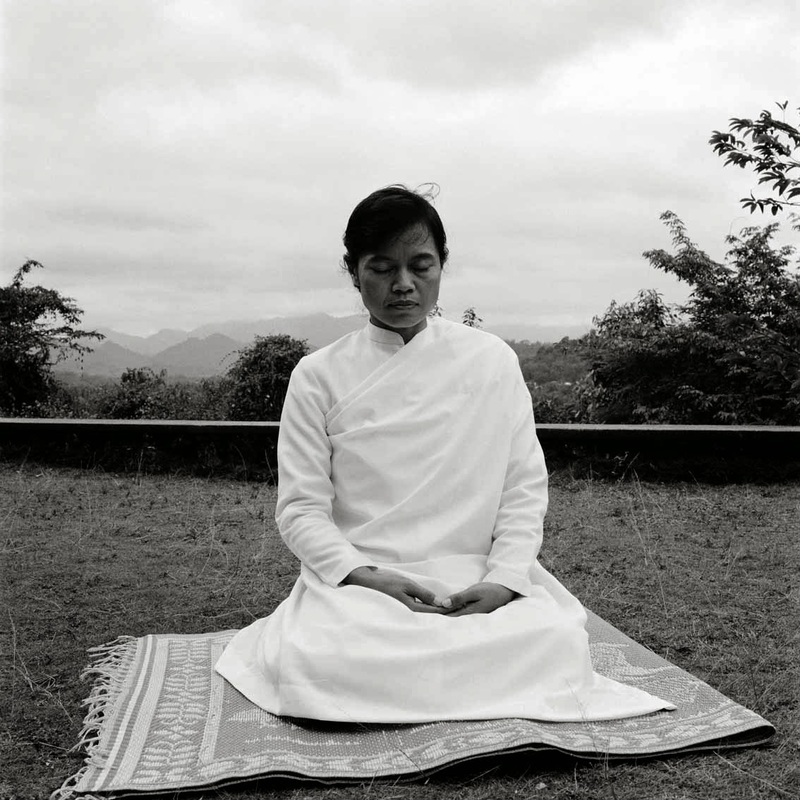 Adrian Zecha, founder of Aman Resorts, prepared the opening of a new Aman resort in Luang Prabang a decade ago. 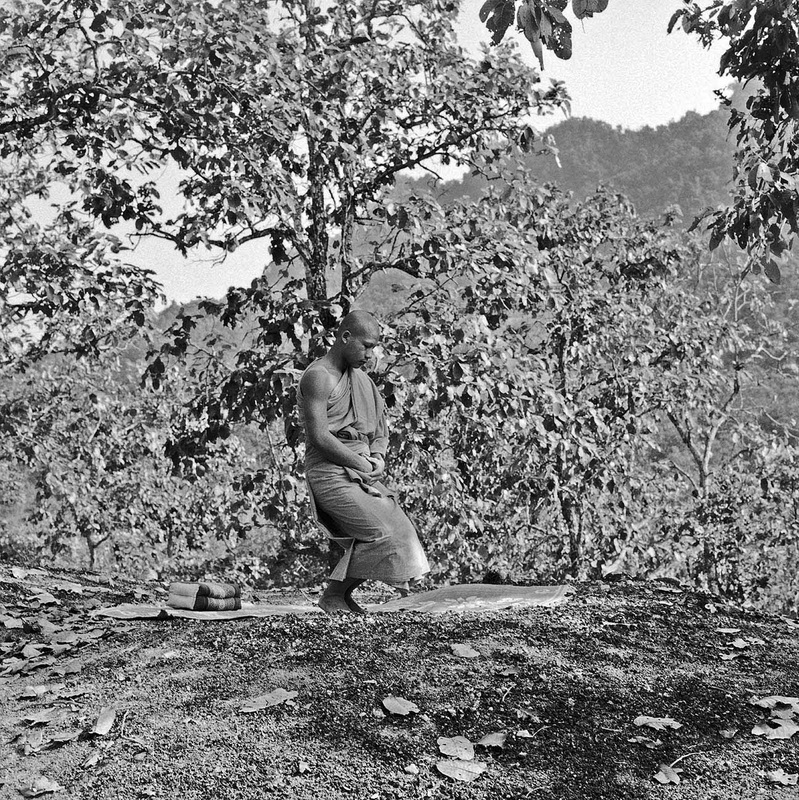 He had known the town of Luang Prabang in the 1950s: a pristine mysterious place, where a serene form of Buddhism reigned, and where Royal and popular festivals expressed rare refinement and sophistication. 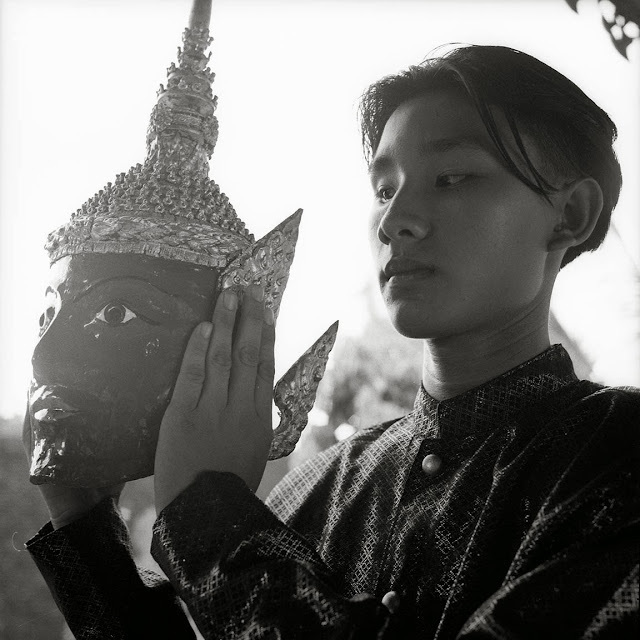 He sought anything that expressed this refinement, and made him find the emotions of his past and early visits to Luang Prabang. Luang Prabang’s sophisticated ceremonies and rituals are “immaterial culture”. They are often made to last only for hours, or the day. Yet, they represent — like no other artifact does — the essential features of the city’s culture: a delight in complexity, beauty and refinement, and a multi-layered spirituality that has been formed over centuries. Some ceremonies are secret and difficult to witness, others are part of highly public events. They have been and continue to be subject to rapid change. Conscious of this change, the monks of Luang Prabang, together with a Berger, built a project of documentation and artistic representation around this most precious and fragile heritage. Adrian Zecha wanted these photographs as a strong, unique artistic presence in his hotel; he gave carte blanche to Berger in order to decide what to show, how many photographs. 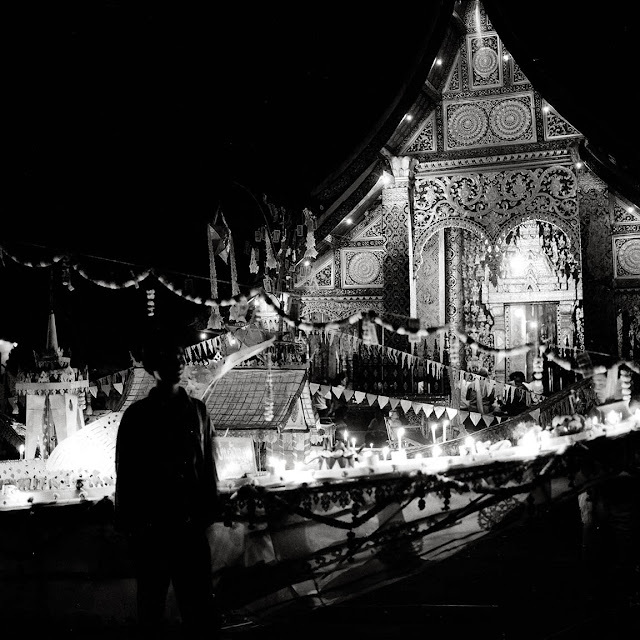 Now, the ceremonies and rituals of Luang Prabang are on view in all rooms and public spaces. 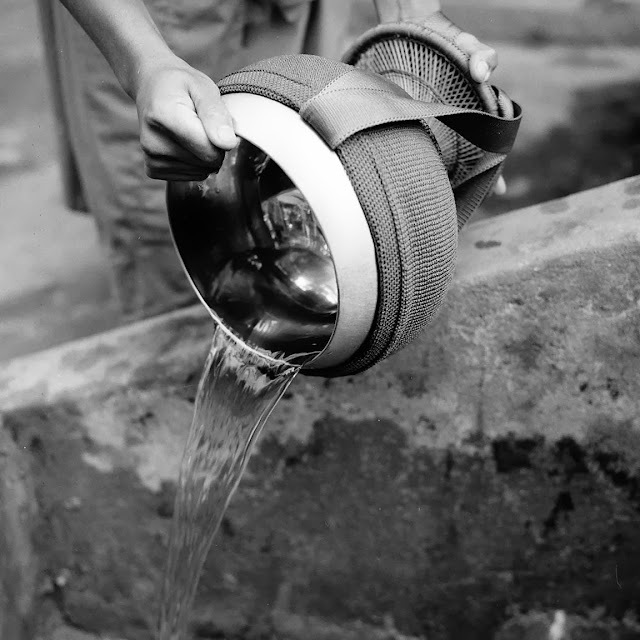 "These photographs represent the soul of Luang Prabang", Adrian said when he saw the installation at the moment of the inauguration of AMANTAKA in 2009. These 150 black and white Fine Art photographs constitute now the AMANTAKA collection. But Adrian Zecha wanted more: he decided with the artist that the photographs of the collection should form a limited edition, and that the resort should function as an exclusive gallery for them. 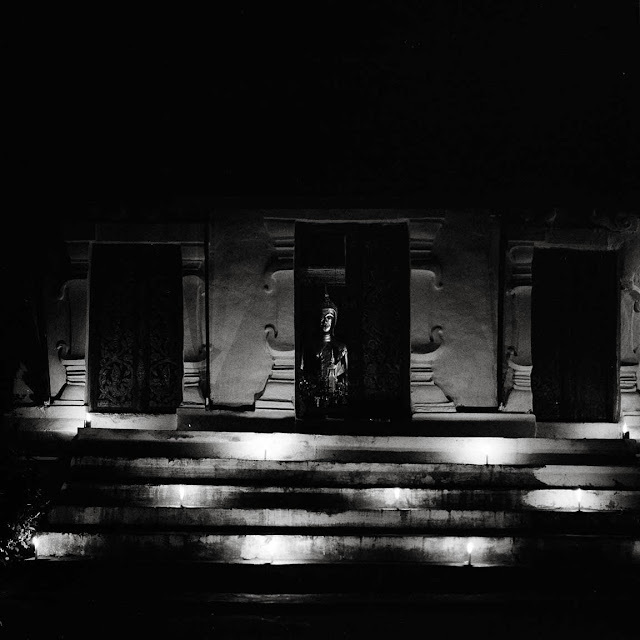 It is this bold attempt of precise documentation, contemporary artistic creation and inter-cultural discourse that forms the uniqueness and strength of the choices made for the AMANTAKA Collection." Adrian Zecha wanted to try to make the hotel work as a gallery for a limited edition (it does). These prints can be acquired. Many hotel guests have become avid collectors. What’s next for Hans Georg Berger? Writing has a greater importance than photography in my work at the moment, but I continue to collaborate on photography at Luang Prabang. I have just done a book on Egypt, and my time there with French writer Herve Guibert. I am finishing the manuscript of a book on botany and gardens that I created on the island of Elba, in the 1990s. 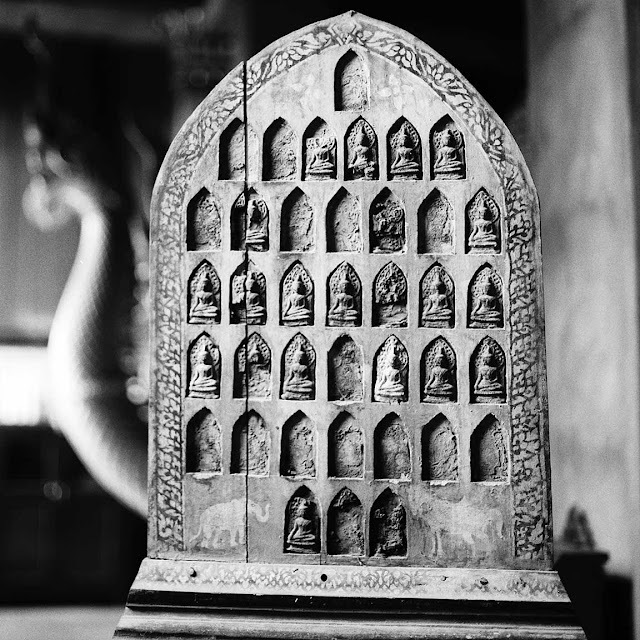 Another curious thing is a text on Buddhism, written for a young Shi'ite clergy, in a religious school in Iran, that still needs some amendments.And a great dream (in the drawer) is to do THE major book on my photographs on Lao Buddhism. Very clear in my head, almost page after page. He lives in Luang Prabang six months of the year, and is peripatetic for the rest of the year, traveling to Egypt, throughout Asia, around the Mediterranean and to Germany, among other regions. 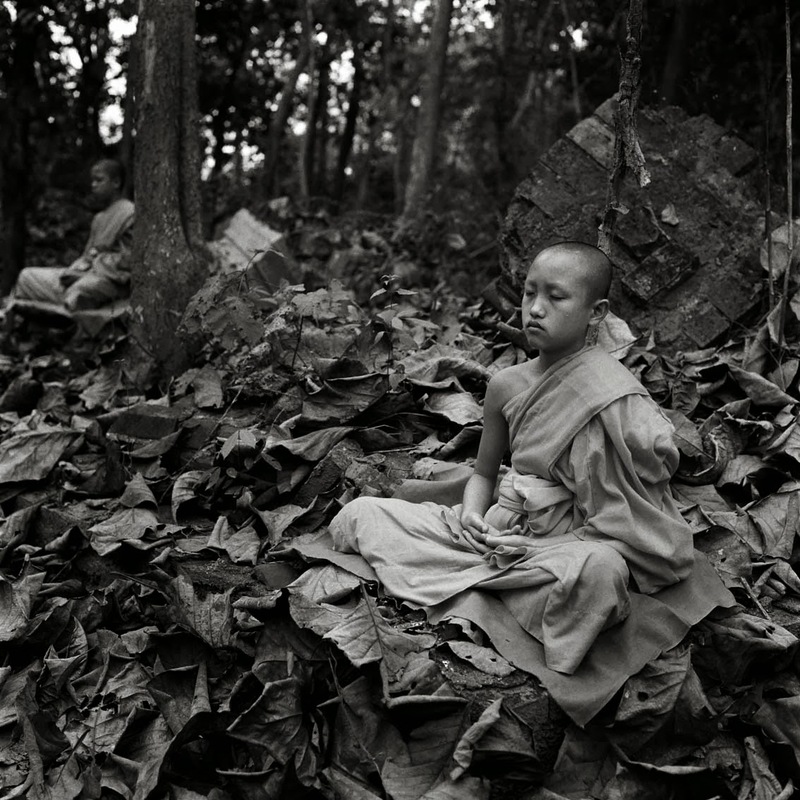 Hans Georg Berger is a photographer and writer working on long-term art projects involving world religions. His method of “community involvement” is at the base of cross-cultural art projects bringing together local communities in a collective effort that links documentation and analysis. 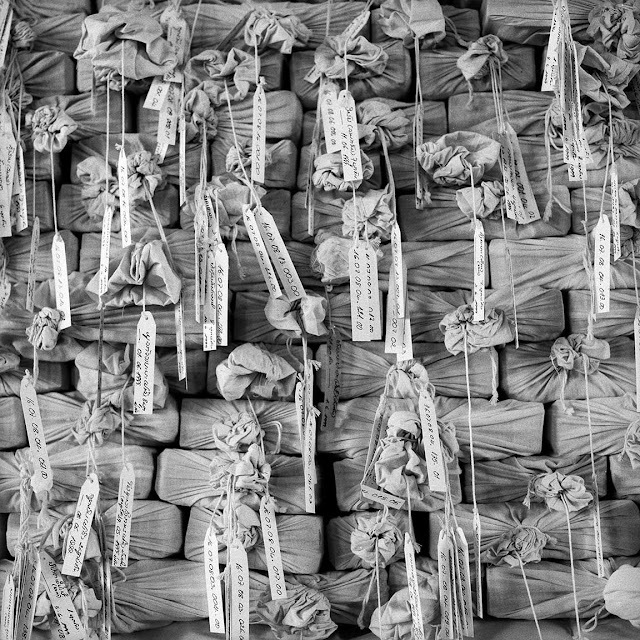 Hans Berger’s photographs are present in public and private collections in Europe, Asia and the U.S. 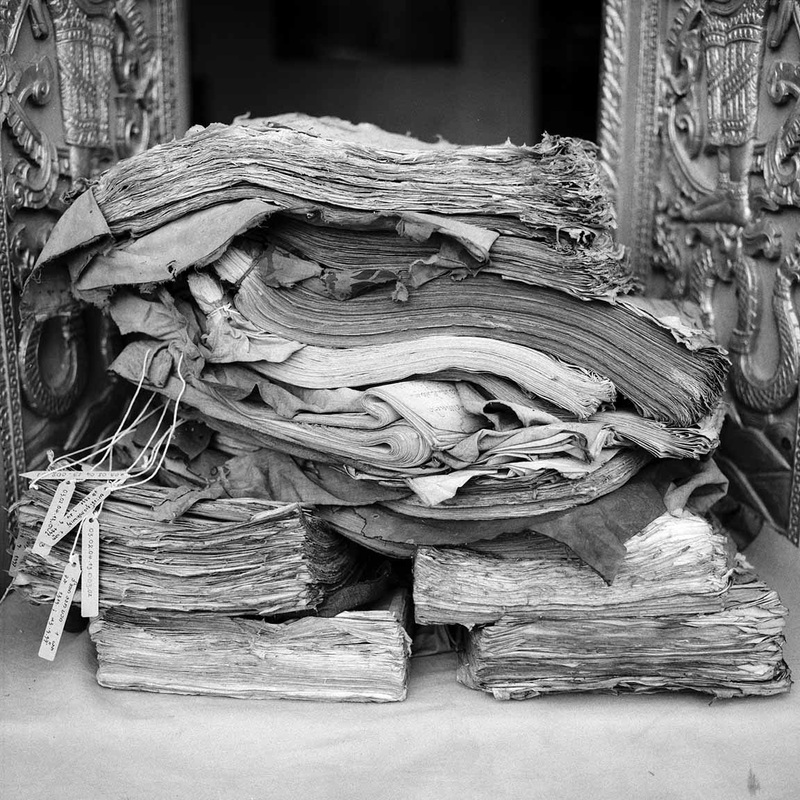 In connection to his work in Luang Prabang, he directs a major research project of the British Library, London, on the collections of historic photographs preserved in Luang Prabang’s monasteries. 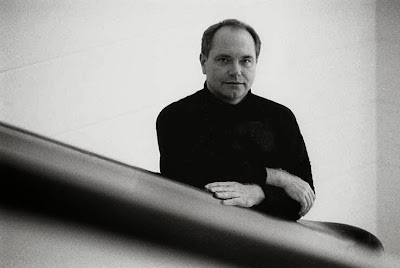 He was born in 1951 in Trier, Germany. Amantaka resort in Luang Prabang sells these photographs in a limited edition. They are signed and numbered by Berger, and stamped, as part of the Amantaka Edition. 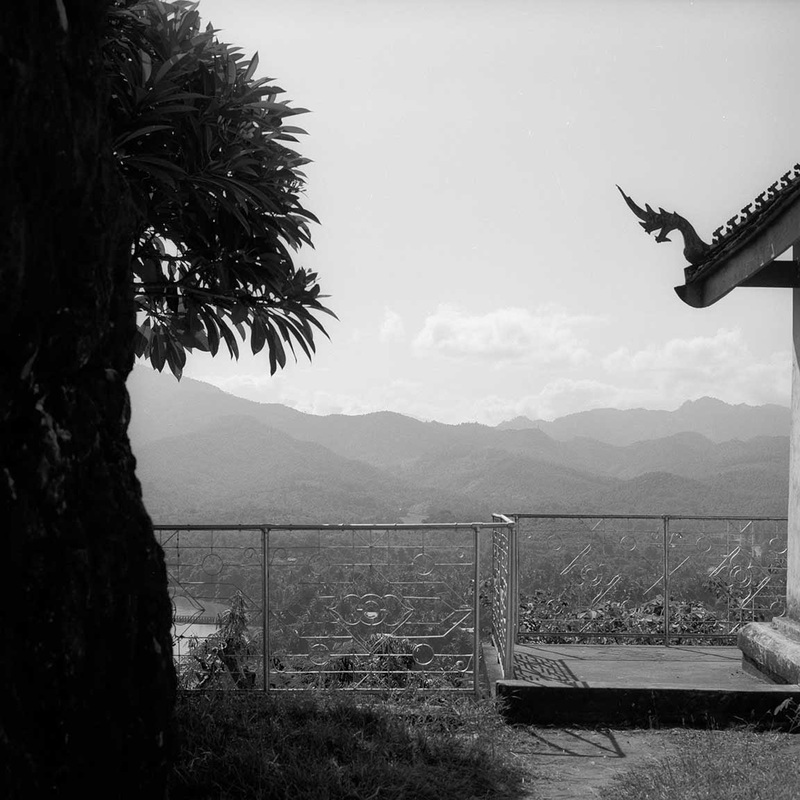 "HIDDEN LUANG PRABANG: A guide for the refined and curious visitor" which has just come out. It is a folding book made in the traditional Luang Prabang way, with the only good map of temples and sacred places of the town. 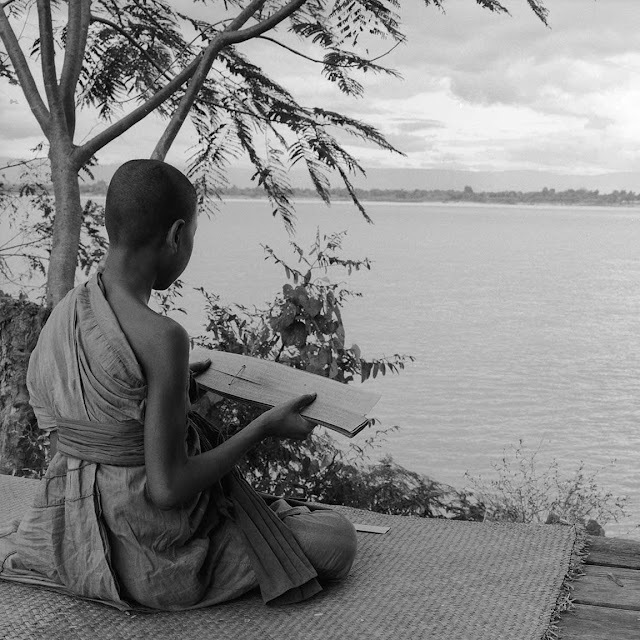 Khamvone Boulyaphonh, Lao, a Buddhist monk and researcher. I wish my dear readers around the world a happy and calm festive season. Next week on THE STYLE SALONISTE will be my final report on Luang Prabang. I’m featuring a hotel in Luang Prabang that I admire, La Residence Phou Vau. 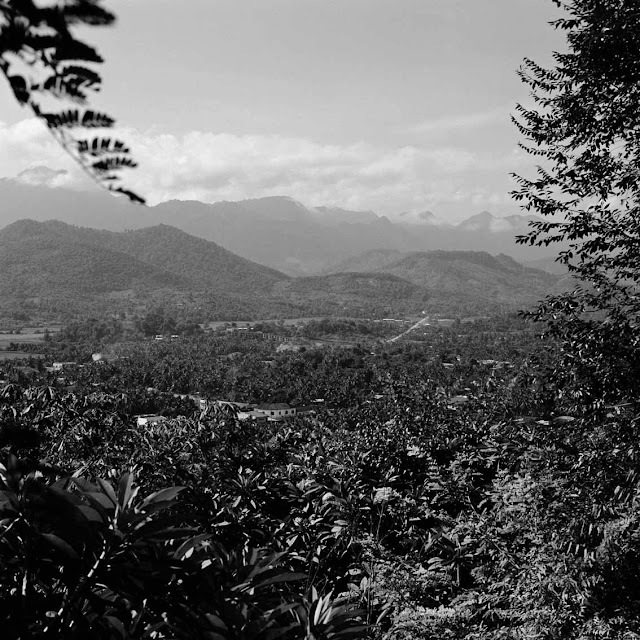 It’s on a hill overlooking the town, the Mekong Valley and the mountains beyond. It’s set among lush flowering trees. Come and discover it with me—and see more insider treasures of Luang Prabang, next week. I always enjoy your posts but these posts on Luang Prabang are, for me, some of your best. Thank you so very much on introducing me to this part of the world. Thank you so much for your kind comment. I appreciate it very much. As you can see, I was very inspired by this recent trip to Laos. It's a communist country, one-party rule, authoritarian, but it is also Buddhist--and that makes all the difference. It was also a French colony. All of these elements--and the beautiful setting and lovely Lao people--made a magical and peaceful experience. I highly recommend it. Be sure to note my points about going in 'low' seasons. My days were quiet, tranquil--thanks to the 'rainy season' which kept groups and tourists away. I note also that many travelers see Luang Prabang as a jumping off point to go hiking or adventuring in the jungle. Some go to explore elephant camps. I applaud their sense of adventure. I took an afternoon cruise up the MEKONG RIVER…which was much more beautiful and dramatic than I imagines. Truly, every day was a discovery. I hope you go there! Travel well.